Should also note that the VC map you posted is highly inaccurate. You'll want to look at the actual VC model in the old version I sent you to see if maybe you can work out where it would go. I actually knew that, I just needed a quick reference to show what I meant, I didn't want to draw it out. Fair enough. Still, if maybe you could do a slightly more detailed rough representation using the VC model, that would definitely help work this out. I like what you've come up with so far, the question is, will it work out? Looks nothing like what is seen at the end of the movie, and there's no way the Rex could destroy 3-4 feet of solid concrete. Yeah, I think I see what you mean. In that case, the planters would stay (it looks to me like the "sky" outdoors could pass off as an unpainted gray concrete wall) and the window and patio would be added to the back side of the building, possibly connecting with an entrance to the turret. Since you don't see that wall in the movie, we could stick a window in there without issue. The potted plants and such look odd enough that I think they could be left out, with a simple hole in the wall to suffice the explanation.. The planters are there in the movie though, or at least some of them are, so they're staying. 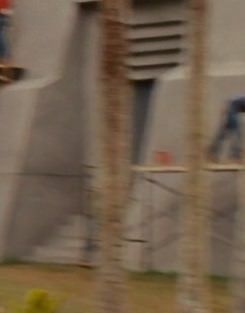 Like I said above, there can't just be a hole in the wall - the Rex would have to go through several feet of concrete, which simply isn't possible (unless you're the Indestructible Rex from JW, in that case you can go ahead and smash through several layers of thick cement without stopping somehow). The planters could of been a film mistake being left out there for the VC interior set's outside foliage but to me it works in this case. That wouldn't surprise me actually, or alternately they could have been intended for the exterior but were moved to their current position once they decided that the Rex had to get into the building. 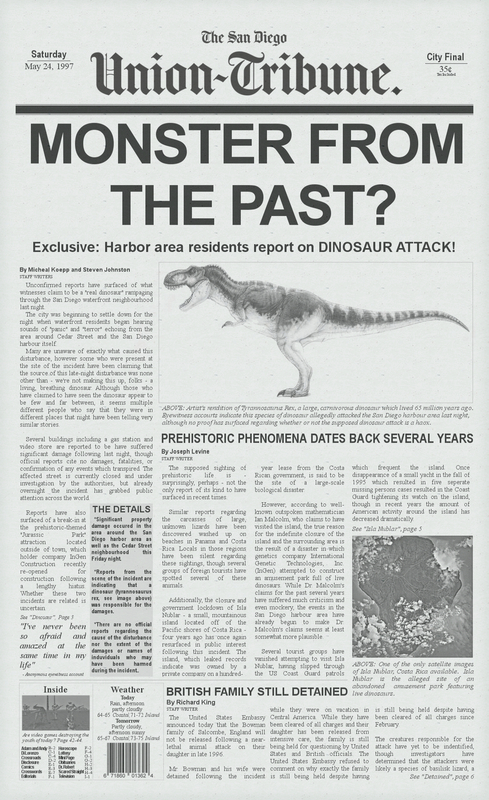 A San Diego newspaper article dating to May 24th, 1997. Contains some very interesting information for those who doubt the validity of Dr. Malcolm's claims and the InGen Incident.